Two weeks ago, the ‘Nunatak’ Adventure Tour Guiding students were out and about for three days following the Tasman Peninsula Circuit along bush tracks, long stretches of board walks and steep, slippery wet eucalyptus banks. This was our final bushwalking trip within the comfort of the Adventure Tour Guiding program before heading into the summer season as qualified guides. Some students had already been assessed on previous trips and could happily tag along as ‘customers’ while others were bearing the full load of guiding, catering and interpreting. The scenery was spectacular, food was palatable and the weather was kind. Managing the group whilst navigating unknown terrain proved a great challenge for the up-and-coming guides who all did their best to provide a great walking experience, whilst keeping everyone safe, happy, hydrated and fuelled across long days of walking. After an easy first day heading inland from Fortescue Bay along the Cape Pillar Track we based ourselves at the Wughalee Falls campground for two nights. We headed out on the 17 km return trip to Cape Pillar’s stunning cliffs overlooking Tasman Island on Day 2, and braved the steep ascent over Mount Fortescue on Day 3. By this stage, the final track to Cape Hauy was just a hop, skip and jump. By the end of it all everyone was relieved to have made it back to the bus at Fortescue Bay as the day was slipping away rapidly. As a guide, be caring and compassionate! Check in with individual group members to make sure everyone is in good spirits! $500 to walk the Three Capes Track is well worth the investment; and if you want to get pampered, spend some extra on the Tas Walking Co’s experience! Cooking on camp stoves always takes longer than estimated! Snakes and spiders are much less frightening and dangerous than their reputation! You can disguise fake-meat in a Bolognese and no one will notice! Two weeks, Team Tombolo [Adventure Tour Guiding students] embarked on their second adventure to Freycinet National Park, the homeland of the Toorernomairremener clan. The group was blessed with beautiful Spring weather and had an amazing time soaking up another beautiful part of Tasmania. The two teams split off to walk the Freycinet Peninsula, and students were given the opportunity to guide their groups around sections of the 30km Circuit. It was awesome to see the students bring their own true personality into their ‘Guiding’. The guides experimented with new group activities, supported individuals over difficult terrain, cooked up amazing meals on the MSR stoves, and really sunk into their position as group leaders. It’s quite astounding to think about how far the class has come since the beginning of the course. Many of us agreed that, for the first time, it really felt like we were guests on a guided tour. Our wonderful teacher, Alex Hale, joined us for our trip to Freycinet. Having spent some time working as a guide in the area, Alex was an endless source of knowledge of us all. The group had a lot of fun identifying bird calls, spotting wildlife and combing the beach for washed up ocean creatures. It was also really cool to spot some beautiful orchids poke up from the earth, and to see the vegetation shift from coastal, to dry woodland, to wet forest, to alpine species. Students were also allocated topics on the area and shared stories and facts about some of the wonderful wildlife found on the East Coast. We learnt about the fascinating history of the Thylacine and some amazing coastal birds, the Short-tailed Shearwater and the Little Penguin. We also learnt about the snakes of Tasmania, the evolution of dragonflies and the story of the whales that visit our island. For the group, some other highlights from the trip included a brisk dip in the waves at Wineglass Bay, reaching the summit of Mt Freycinet, soaking up the incredible views over the Peninsula, practicing midnight tarp maintenance and a friendly encounter with an Australian Fur Seal. Returning somewhere for a second time can sometimes produce a very different experience. You tend to tune into the particular subtleties about a place, and I think a vast majority of the group has left Freycinet National Park with a very special sense of connection. All round, it was a great trip with some great friends. Big thanks to the amazing teachers at TasTAFE and an incredible group of classmates. The ‘Nunatak’ Adventure Tour Guiding group spent three glorious days in the Walls of Jerusalem late last month. After the long drive from Hobart, we headed up the hill and were delighted to see some small patches of snow at Trappers Hut. The snow started to be more prominent once we reached the top of the plateau. We got to our campsite at Wild Dog Creek just before dark and saw to our delight that the tent platforms were completely covered waist deep in snow. We spent over an hour shovelling the platforms so we could get our tents up, while the caterers prepared our meals. We had a scrumptious dinner, then hit the sack early. The next day we started building a snow cave. All hands were on deck for that mission and we had ‘shovelers and padders’ building it for hours before we decided it was tall enough. We then walked up to Damascus Gate and into the central Walls area itself. We were stunned by how scenic the area was with frozen lakes, snow-covered mountains and stands of ancient Pencil Pines. We experienced some fantastic Interpretation about alpine vegetation, conifers, crayfish/mountain shrimp and lizards by student’s Kate, Tim, Maddie and Katri. We got back to camp in the early afternoon so the excavation of the ice cave could begin. A couple of students slept in the cave overnight and reported that it was very cosy, with no condensation at all. We had a delicious breakfast the next morning, followed by a quick pack up. In conclusion, our group had a truly epic trip with beautiful scenery, tough walking conditions with slippery ice and thick snow, a cool ice cave we built ourselves and the experience of everything freezing over. Thank you to our Instructor’s Sue Beaumont and Ashley Kestle. On Tuesday the 11th of September the Certificate IV in Outdoor Recreation students donned their instructor hats and took the ‘Nunatak’ Adventure Guiding Class for a day of River Crossing training. The Derwent River (at the Plenty Railway Bridge) provided an excellent setting to practice a variety of solo and group crossing techniques, as well as whitewater swimming. The infamous artificial strainer was set up in two locations, but it didn’t quite live up to its fearsome reputation as all the Adventure Guiding students negotiated it with ease. The day ended with a convoluted “scenario” involving a broken femur, asthma, a daring white-water rescue and an impending job interview (which the leader thought was real!). Certificate IV in Outdoor Recreation students hit the bush again recently. The vibes were high and the snow flakes were falling. The students spent the four days consolidating off track Navigation skills such as walking on a bearing, interpreting micro features in the landscape and observation of vegetation changes. The group split in to two teams, and were lucky to be accompanied by Instructor and legend Sue Beaumont and Teachers Assistant and champion Ash Kestle. In late Autumn, five Certificate IV in Outdoor Recreation students, their instructor Kim Ladiges, and a whole heap of climbing gear squeezed into two cars and headed to Freycinet National Park. With minds full of knots and three-point anchor systems from a pre trip workshop, the students were well prepared for the newly appointed introduction to abseiling short course. Perched safely on the gleaming granite cliffs of Tasmania’s infamous east coast the students learnt how to apply their knowledge of three-point anchor systems, whilst ensuring personal and group safety parameters on cliff edges. They also touched on briefings, and learnt how to fit harnesses and helmets. Not to forget the unexpected schooling on the dexterity and ingenuity of possums. Special thanks to Kim Ladiges whose experience, teaching style and empathy enabled all the students to cross some personal barriers and move closer to being abseil guides. Although they weren’t impressed he couldn’t extent daylight hours so that they could stay on the cliffs longer. The first day of week two kayaking for the Nunatak group began at Nutgrove Bay. This week we had two nominated students each day take on the role as guides. The week was also focused on our skills in interpreting weather. The well-known ‘Fish and Chipper’ trip was our plan for the day. After getting on the water aided by a breeze, we had the quick trip to Constitution Dock, though experienced strong gusts on the trip back, while practicing our towing. Day two was a calmer morning at Cornelian Bay. We paddled down the Derwent along the Domain Highway and found shelter in coves along the way from the winds. As a group we paddled under the Tasman Bridge and admired the scenery of Hobart and surrounds. A lunch break again in Constitution Dock gave us shelter from the winds and we practiced some strokes in the calmer waters. We paddled through familiar waters down to Nutgrove Bay to conclude or day. By Day three, the winds had eased further and we departed from Tinderbox Reserve and paddled north along the coastline towards Blackmans Bay. The scenery was superb with views of Dennes Point on Bruny Island. As the location was unfamiliar to most, it a good experience to kayak in less known waters. We ended our day with the assistance in performing our first surf landings successfully. Our final day of the week saw us have our most glorious weather yet. Starting from Taroona Beach we all gathered up together in the water looking up to the Shot Tower where our guides provided some background information. The gentle winds and seas helped make it an enjoyable experience for everyone as we also soaked in the spectacular Alum Cliffs. Sitting outside of Kingston Beach we had spectacular views to kunanyi/Mt Wellington as we all sat and enjoyed the calm waters and mountain views. The group then individually performed their own surf landing on Kingston Beach for a quick-lunch break, and in no time we were back on the water and kayaking past a few sea caves. Before landing once again at Blackmans Bay, we all practiced our T rescues in the chilly water. We had yet another surf landing to end the day and some took the opportunity to practice their paddle float rescues. A big thanks to Tom and Gemma for their time throughout the week. 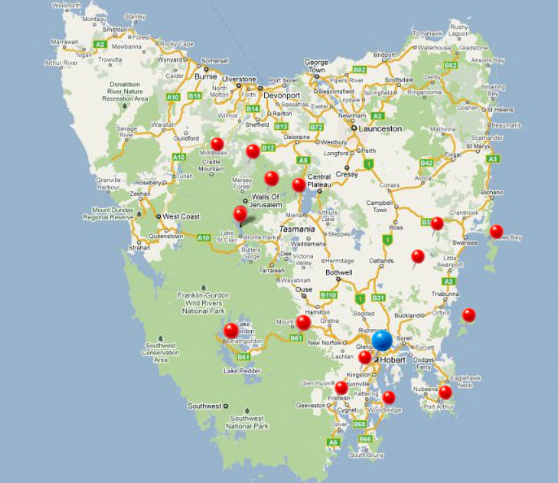 Our Certificate IV in Outdoor Recreation students have been out and about training on Tasmania’s amazing rivers.